In an effort to seek some R&R, I sat down with my significant other to discuss the possibility of a holiday. Like most, we have put in the graft, working day and night to pay for all of life’s little joys; the mortgage, bills, my princess of a dog’s specific dietary needs…we, like many, were in need of a break. So one night we sat together and explored website after website, each suggesting ideas and quickly dismissing them. Arguments breaking out over flight durations, destinations and how this whole holiday finding process was actually a reflection of a deep routed inability to commit (sorry, it got personal). The point is, sometimes booking a relaxing escape abroad is one of the most stressful experiences. Then it occurred to me, why am I so desperate to escape a part of the world that tons of holidaymakers would die to visit? 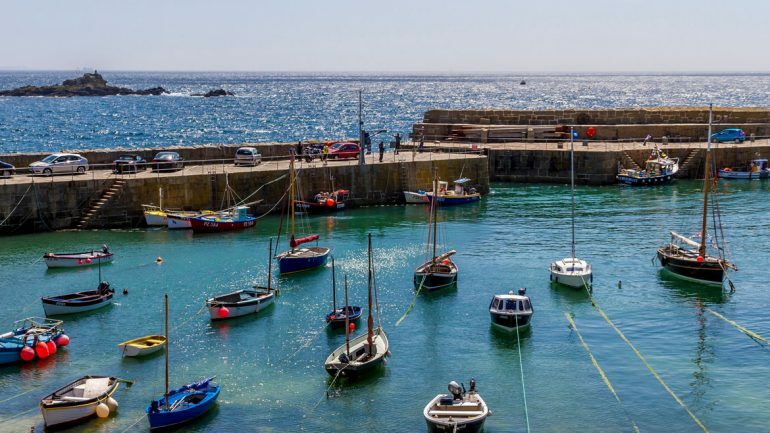 Our neighbouring county Cornwall is widely regarding as one of the most beautiful parts of the country, offering breathtaking views, art, renowned culinary haunts and some of the world’s most beautiful beaches – light bulb alert. It hit me, why don’t we swap our vacay, for a staycay? So, we decided to turn to the awesome team at ‘Beachspoke’ – luxury holiday home specialists – who helped us snag a stunning rental, located in the charming Cornish village of ‘Mousehole’. We arrived in Cornwall, a pinch weary from our 4-hour car journey, which by all standards was far more pleasurable (and scenic) than the less than alluring sight of the M3 on route to Gatwick. After a quick pit stop in Penzanse, where we stocked up on all the essentials – aka pasties, clotted cream and cider – we headed for our crashpad in Mousehole. After a blazing trail through winding country roads and narrow village streets we had arrived. We pulled up in the world’s most scenic car park, adjacent to the twinkling waterfront and headed towards the ‘Harbour Moon’ cottage. Prior to our visit Olivia (our staycation guru/Beachspoke tour guide) had given us the code to a tiny security box that would unlock the key to the door. We guided the key into the lock and pushed open the door – deep breath – and WOW. I stepped down into the kitchen come sitting room. Every inch of the space was adorned with style. The matte marble-esque worktops with chrome trimmings, the exposed stonewall, the driftwood sculptures; everything was gorgeous. Our exploration was heightened as we climbed the nautical rope-aided stairwell, only to discover the stunning boudoir above. We crept in, taking in every nook and cranny. To the left, bronze-flecked tiles flowed seemly from floor to wall, creating a contemporary wet-room, complete with walk in shower and a copper basin. White fluffy robes hung up tied with a bow, set the tone for what was to be a truly lavish layover. We continued into the room our excitement growing. A grand bed took pride and place centralised in the latter part of the room, it’s headboard the divide between bathroom and bedroom. I looked up to discover fishing nets woven between the white beams with a large copper pendant light suspended over the divan. A beam of light crept over the bed, inviting us to the furthest part of the room. I went to open the curtains before being distracted by the glass floor below me that looked out onto the living space below. The natural light coming from the open window below reminded me of the magnificence of seaside living. Finally I crept towards the rustic café-style shutters and pulled them apart, revealing the picturesque harbour view that had been hiding behind it. It was breathtaking. Excited to explore the town we threw on some fresh clothes and hit up the local haunts. Based on the recommendations in our Harbour Moon guidebook, we decided to pay a visit to the ‘Old Coastguard’, a popular restaurant on the cliff top overlooking the sea. To get to the restaurant, we strolled along the rockery and climbed a stone stairwell that disclosed a beautiful garden. We crept in through the double doors and snagged a table. The meal was delicious, complete with local gins and fresh seafood. Feeling full and fully inebriated we made our way back to the cottage to enjoy our first night in that enormous bed – lights out. We awoke in the sun-filled room ready for a day of exploration, though the feeling of duck-feather pillows and a sumptuous mattress made it hard to actually leave. Adam – my partner whom I mentioned in the beginning – true to his heroic nature, gathered breakfast supplies (from the quaint local post office I might add). I tore myself away from bed and headed to the first place anyone on holiday goes: the fridge. I opened the door only to reveal a bottle of sparkling English wine, a half pint of milk and some eggs. What a lovely touch. I was at a beverage related crossroads; I had planned to assemble a coffee from the very lovely looking Nepresso machine, but now I had discovered the sparkling wine? Like anyone else in my position I weighed up the options and decided that having both was the only way forward. Gathering my drinks I headed for the bathroom. A sip, disrobe and another sip later, I was enjoying the marvellous sensation of a rainfall shower. I thought; if this is how the other half live, I want to trade sides. Another day of adventure concluded and we began our usual holiday ritual of changing for the evening affair. Tonight we decided to visit the famous ‘2 Fore Street’. Owner and operator Joe (who actually took our booking that morning) served some of the best food I have ever had. The quality, flavour and evident passion spoke through the food and the service from their fantastic team heightening an already incredible experience. We returned to our pad for the last time. In an effort to savour as much of this wonderful property as we could, we perched in the living room enjoying the fresh scones and raspberry conserve we had picked up earlier that day. As our eyes grew heavy we decided to tuck ourselves into our opulent marshmallow bed once more.